This bluestone porch has had surgery but you can't see it - a kind of nip/tuck for masonry. 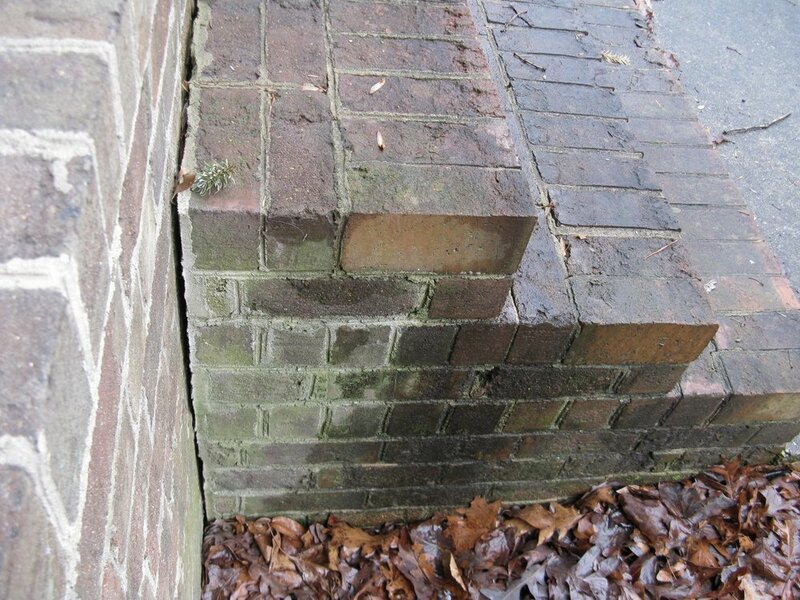 It's a common problem with older homes and even some new ones around Raleigh. The footing for the steps isn't attached to the porch or worse yet, there's no footing at all. A footing is just a concrete substructure that provides a solid base for masonry. 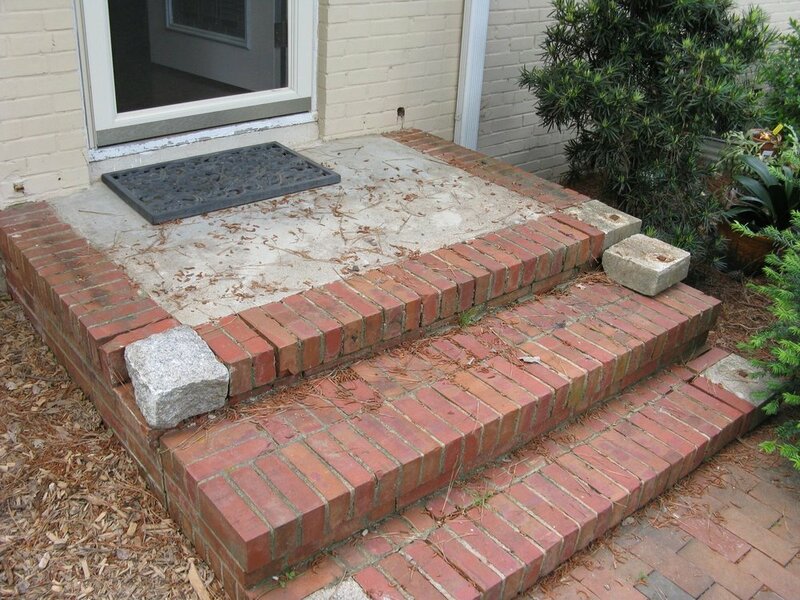 Over time, without a solid footing, the steps may separate from the porch. The porch may separate from the house or both may happen. If the porch drops or pulls off the house, it's certainly not a pretty sight, not to mention a safety hazard. This scenario probably won't keep you up at night. Although, the worst case we've seen probably would. It was a job that had a 20' long masonry porch at the front of the house with no support along the backside of the porch. The exterior of the house had been constructed with 6" thick building stone that sat atop the unsupported back edge of the porch. Not surprisingly, the porch buckled under all the weight. The stone on the exterior of the house dropped 6" in some places. The window sills on the first floor cracked in half. When it rained, water flowed behind the porch and into the basement through the foundation. The drainage pattern in a yard and events like hurricanes and drought can impact whether masonry will shift too. During Hurricane Fran, which swept through Raleigh in 1996, those unfortunate homeowners had 5' of water in their basement. You can imagine the time and expense involved in fixing these types of problems. Getting back to the bluestone porch above - here's what it looked like before it was reconstructed. The porch was off-center and in disrepair, but it was firmly attached to the house. To recenter the porch in front of the doorway, it was rebuilt several inches to the left. The landing was built from 2" thick cut pattern variegated bluestone. The loose steps were pinned to the porch with rebar and then covered with 3" thick single pieces of bluestone. The risers were built from local granite. Once the original steps and porch were secured, the new stonework can correct for level and risers of varying heights. When done well, these types of repairs should be permanent and invisible. Now, if only we could say the same for celebrity face-lifts. 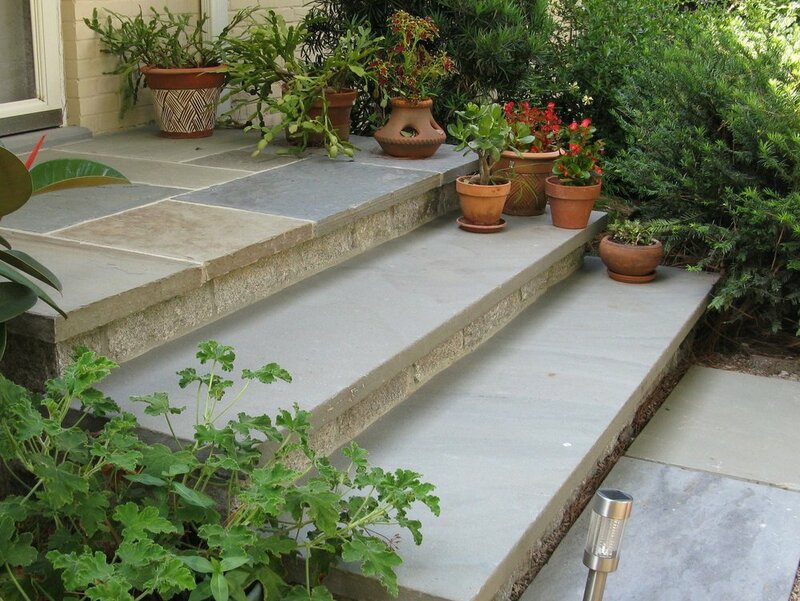 Visit our portfolio to browse other examples of stone steps, porches and staircases. Your comments and questions are welcome below.